A Goodyear Blimp flies over swimmers in the algae-covered Qingdao Bay off the Number 6 Bathing Beach in Qingdao, Shandong, China...Qingdao is the host of the sailing events for the 2008 Summer Olympics. 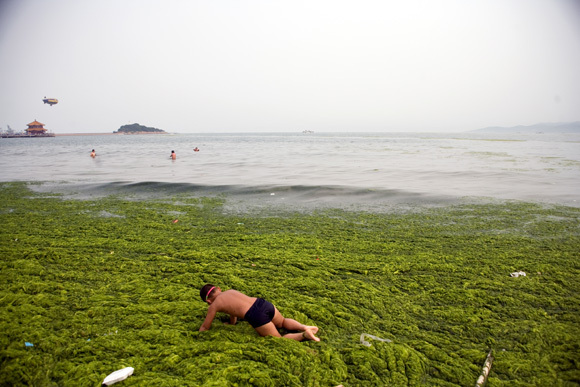 Algae blooms like this have become common in inland lakes in China, often caused by high pollution in bodies of water. 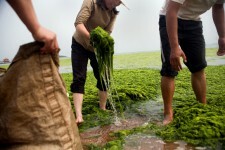 The city is asking for help and forcing residents to take part in the cleanup effort before the Olympic events..
Workers and volunteers try to clear algae from the Number 6 Bathing Beach on Qingdao Bay in Qingdao, Shandong, China...Qingdao is the host of the sailing events for the 2008 Summer Olympics. 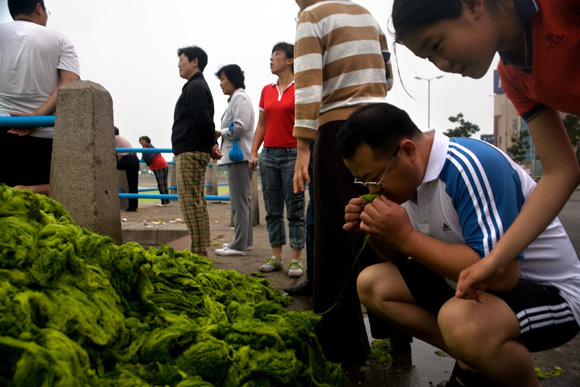 Algae blooms like this have become common in inland lakes in China, often caused by high pollution in bodies of water. The city is asking for help and forcing residents to take part in the cleanup effort before the Olympic events.. Tourists and pedestrians look at a pile of algae on the sidewalk near Qingdao Bay in Qingdao, Shandong, China. ..Qingdao is the host of the sailing events for the 2008 Summer Olympics. Algae blooms like this have become common in inland lakes in China, often caused by high pollution in bodies of water. 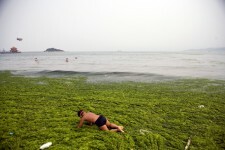 The city is asking for help and forcing residents to take part in the cleanup effort before the Olympic events..
A young boy crawls through algae-covered water off the Number 6 Bathing Beach on Qingdao Bay in Qingdao, Shandong, China. ..Qingdao is the host of the sailing events for the 2008 Summer Olympics. Algae blooms like this have become common in inland lakes in China, often caused by high pollution in bodies of water. 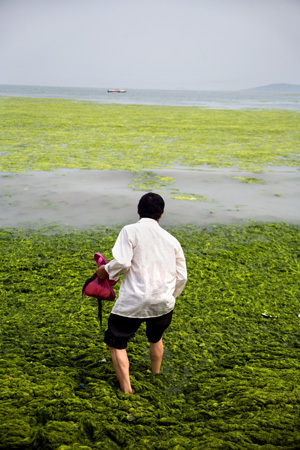 The city is asking for help and forcing residents to take part in the cleanup effort before the Olympic events..
A man stands knee deep in algae-covered water off the Number 6 Bathing Beach on Qingdao Bay in Qingdao, Shandong, China. ..Qingdao is the host of the sailing events for the 2008 Summer Olympics. 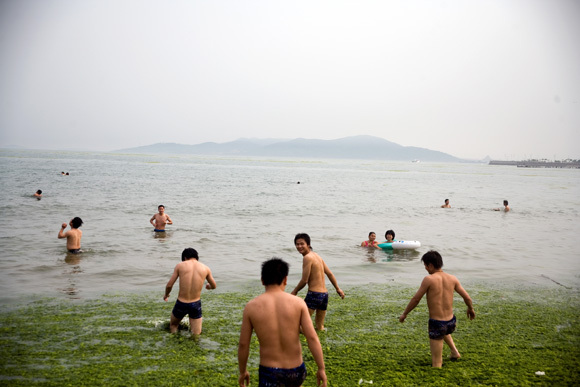 Algae blooms like this have become common in inland lakes in China, often caused by high pollution in bodies of water. The city is asking for help and forcing residents to take part in the cleanup effort before the Olympic events.. 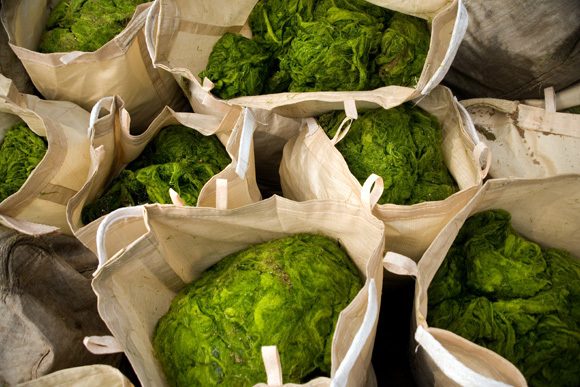 Bags filled with algae wait to be removed from the Number 6 Bathing Beach on Qingdao Bay in Qingdao, Shandong, China. The bay is covered in a large algal bloom. ..Qingdao is the host of the sailing events for the 2008 Summer Olympics. 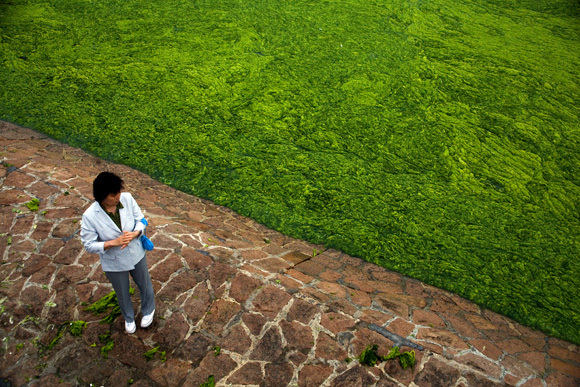 Algae blooms like this have become common in inland lakes in China, often caused by high pollution in bodies of water. 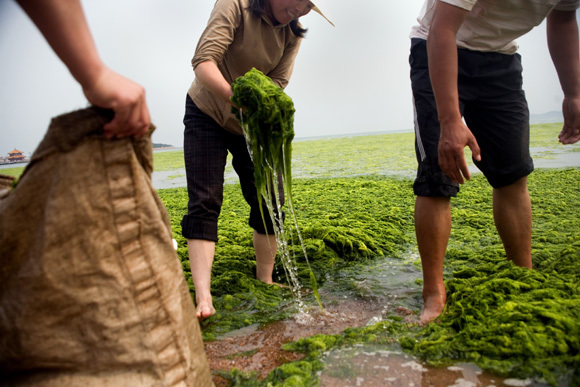 The city is asking for help and forcing residents to take part in the cleanup effort before the Olympic events..
A woman stands on the banks of Tuandao Bay in Qingdao, Shandong, China, during an algal bloom off the coast. ..Qingdao is the host of the sailing events for the 2008 Summer Olympics. 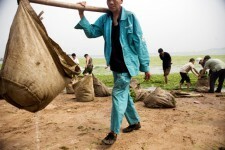 Algae blooms like this have become common in inland lakes in China, often caused by high pollution in bodies of water. The city is asking for help and forcing residents to take part in the cleanup effort before the Olympic events. 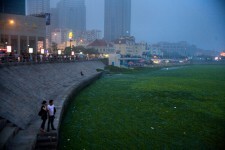 Tourists look over the algae covering Qingdao Bay in Qingdao, Shandong, China...Qingdao is the host of the sailing events for the 2008 Summer Olympics. 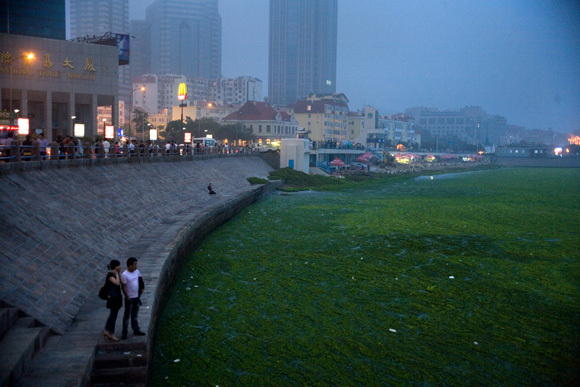 Algae blooms like this have become common in inland lakes in China, often caused by high pollution in bodies of water. 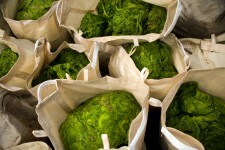 The city is asking for help and forcing residents to take part in the cleanup effort before the Olympic events..
A massive red tide, a bloom of blue-green algae, is covering the South China Sea off the coast of Qingdao. These photos were taken before the Chinese and international media caught on to the story, and before the bloom reached its peak at 5000 sq kilometers, and I managed to photograph it only because I’d been planning to visit Qingdao in the first place. The algae bloom, common in lakes in the mainland, is rare in the sea and was a potentially massive problem for the 2008 Olympics. Qingdao hosted the open water events for the Beijing Olympics, and only with the help of about 20,000 local “volunteers” was the city able to clear the water in time for the events. A bloom such as this is often caused by a combination of pollution and warm water.